The skin normally performs its function as a barrier very effectively. If this is overcome by substances penetrating the epidermis an inflammatory response may occur leading to epidermal damage. These changes may be due to either (a) an allergic response to a specific substance acting as a sensitiser or (b) a simple irritant effect. Dermatitis is an inflammation of the skin. Contact dermatitis is a localized rash or irritation of the skin caused by direct contact the inducing substance to which the skin reacts. Such substances are toxic to the skin and are termed primary irritants. Others may induce an immunologic reaction called allergic contact dermatitis and include plant oils, metals, cleaning solutions, cosmetic additives, perfumes, industrial chemicals, topical antibiotics, and latex rubber additives. Photocontact dermatitis is less common. It’s a reaction that can occur when the active ingredients in a skin product are exposed to the sun and result in irritation. Allergic contact dermatitis occurs when the skin develops an allergic reaction after being exposed to a foreign substance. This causes the body to release inflammatory chemicals. Irritant contact dermatitis is the most common type of contact dermatitis. It happens when the skin comes in contact with a toxic material. Irritant contact dermatitis can also occur when the skin comes in contact with less irritating materials — like soap or even water — too often. People whose hands are frequently exposed to water, such as hairdressers, bartenders, and healthcare workers, often experience irritant contact dermatitis of the hands. Contact dermatitis symptoms depend on the cause and how sensitive to the substance. A full history and physical examination are frequently necessary. A red rash is the usual reaction. 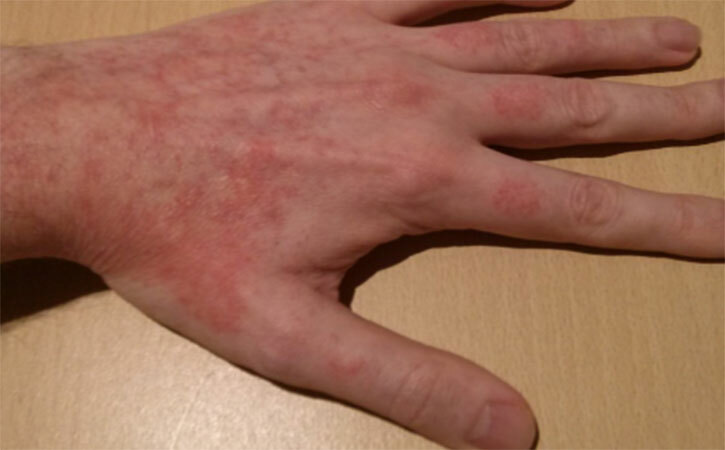 It appears immediately in irritant contact dermatitis, but in allergic contact dermatitis, the rash does not appear for one to two days after the exposure. Skin may develop small fluid filled structures. This condition produces short-lived itchy welts (wheals). Hives are most often induced by allergic reactions to orally ingested foods and drugs, but topical contact hives occurs and is mediated by antibodies. Skin will itch and perhaps burn. Irritant contact dermatitis can be more painful than itchy. Irritant contact dermatitis often affects the hands, which have been exposed by resting in or dipping into a container (sink, pail, tub) containing the irritant. Once a reaction starts, it may take as long as four weeks to resolve completely. They often can appear to be visually identical. Allergic contact dermatitis often results from an immune response to a small, structurally simple molecule. In order to become allergic to such a substance, one must have had at least one previous exposure that eventually induces an immune response. This dermatitis is not caused by an antibody but is due to a cellular immune response mediated by a type of blood cell (T-lymphocytes) that has surface molecules that enable it to recognize specific chemical allergens. When these lymphocytes come in contact with the allergen, they release variety chemicals that are able to produce an itchy dermatitis. Typically, this sort of reaction occurs only on the skin and requires at least 24 to 48 hours developing. Common plants that produce allergic contact dermatitis include poison ivy, poison oak, and poison sumac. The allergenic chemical is present in the oil or latex that covers stems or leaves. Many other substances can cause allergic reactions, including components of hair dyes or straightness; metallic nickel in jewelry and belt buckles; leather tanning agents; and chemical additives to latex rubber. The fragrances in soaps and preservatives and emulsifiers in shampoos, lotions, perfumes, and cosmetics can cause reactions. 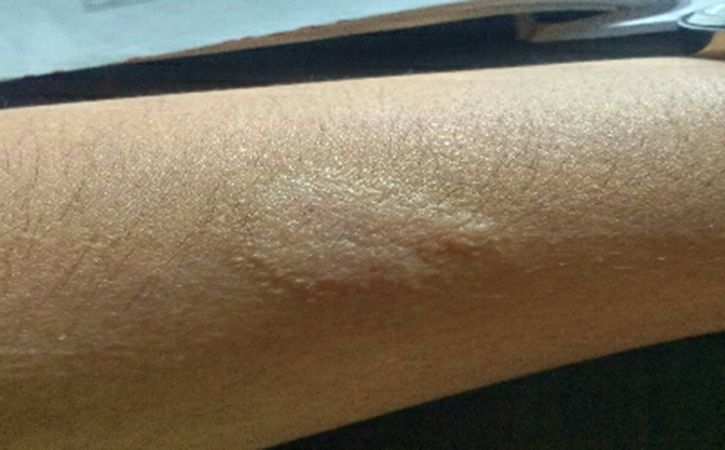 Medications applied to the skin, like neomycin (Neosporin, Neo-Fradin, Neo-Tab), are a common cause of this type of dermatitis. Irritant contact dermatitis results from coming in contact with a substance that is directly toxic to skin. No allergy is required, and it will occur on the first exposure. The longer the substance remains on the skin, the more severe the reaction. Many chemicals, including industrial cleaning products and solvents, can cause this condition. Household cleaners such as detergents can also cause dermatitis. Photocontact dermatitis is a reaction that can occur when the active ingredients in a skin product are exposed to the sun and result in irritation. People with other skin conditions, such as atopic dermatitis, are more likely to develop contact dermatitis. In most cases, contact dermatitis does not require professional medical treatment. Washing with soap and cool water can remove or inactivate most of the offending substance, if it is done immediately after exposure. If blistering develops, cold moist compresses applied for one to five minutes many times a day are helpful followed by air drying, perhaps supplemented with a fan. Do not apply antihistamine lotions to the skin, because an allergic contact dermatitis from the lotion itself. Treatment usually consists of medications to relieve the symptoms until the rash can go away on its own. Corticosteroids, either oral or topical depending on the severity of the reaction. A topical corticosteroid cream or ointment stronger than 1% hydrocortisone may be prescribed to combat inflammation in a localized area. If the reaction covers a relatively large portion of the skin or is severe, a corticosteroid that is taken as pills or as an injection may be prescribed. If the reaction covers a relatively large portion of the skin or is severe, a corticosteroid that is taken as pills or as an injection may be prescribed. Antihistamines: Prescription antihistamines may be given if nonprescription strengths are not adequate. Avoid scratching, which worsens the inflammation. Continue self-care until all symptoms are gone. If treated by health care provider, complete the recommended treatment. Call a doctor if rash is painful or worries, or if it isn’t better after a couple of days. Doctor will take a look and ask questions to help figure out what’s going on. Depending on how severe it is, he may prescribe steroid pills or ointment, and an antihistamine. Doctor can do skin tests to determine what allergic to. If can’t avoid what’s bothering skin, talk to a doctor about wearing gloves or using creams to keep it safe. Our analysis tool is available on the web and on mobile device! Copyright © 2019 Polyfins Technology Inc.| All rights reserved.